A jet-black songbird with bright-red shoulder patches edged with yellow, these can be seen foraging near ground level in croplands, meadows and marshes across the nation. When I was little, my parents would take me on nature walks. They always pointed out the many variety of birds and of course, we had the Roger Tory Peterson "Field Guide to Birds" book on our kitchen counter to be ready for any backyard encounter! I learned to recognize birds by their distinctive songs as much as by their appearance. My mother would always say "Look it up!" whenever I asked her about a bird that I had seen. So, I did. And I read - not only the name but the different sounds a bird would make as well as its picture. I took in more than I realized at the time. Living in Montreal as a kid, we had a lot of Red Winged Blackbirds and I have always been partial to their fuzzy, cheerful whirring spring songs and their swift flights with flickering red wings. It was during these years that I started to collect feathers. Once, during a walk with my mother, we came upon a tiny, perfect birds nest - made entirely of feathers! We still have it, nestled safely in an old jewelry box to keep it safe. Later, we moved to Saint John, NB. I had the very good fortune to live right across the street from the New Brunswick Museum. I would go over almost every day in the summer as a kid, armed with my entrance fee and my sketch book and pencil. I loved to sketch the birds in their natural history section and indeed, I have about four sketchbooks from that time, just full of birds. I got my first job offer there, by the folks who painted the dioramas for the natural history displays. They watched me sketch and took me on a guided tour of how everything was done. I was only ten years old so of course, they suggested that I come back when I was fifteen! As a grown up living in Vancouver, I have continued to be a bird watcher. In my eleventh floor apartment, I have a bird's eye view of the crows making their way home to roost in Burnaby every evening, as well as the pleasure of visiting up close and personal with a couple of friendly blue jays who love to drop by to scold and have a few nuts on my balcony. I have continued to collect bird feathers and can even boast of an eagle feather! I am also pleased to find a few areas on my walking routs around the South Granville area which feature this delightful bird, the Red Winged Blackbird. There is an instant flashback to my childhood and warm memories of my family whenever I hear them and maybe it's the kid in me, but I continue to search for a red feather to this day. "Of them all, Will’s favourite bird was the common red-winged blackbird that sang “o-ka-leeee, o-ka-leeee.” It wasn’t his favourite because of its song nor for its appearance, which was fairly lacklustre when compared to the others. Instead, Will admired it for its bravery. Will had seen a red-wing defend its territory from much larger birds and animals. Anything that dared to enter the red-winged blackbird’s domain, including birds of prey, crows, seagulls, egrets and blue herons, was fair game. Will had heard that red-wings were known to attack squirrels and cats and dogs as well. He could believe this as he once had a red-wing swoop down from above and give his baseball cap a warning peck. Looking around at the time, he realized that he’d just run under a tree branch that held the bird’s nest causing it to defend its territory. ‘Talk about punching above your weight!’ he dreamt. He also liked the red-wing because it was a clean fighter; therefore a kind bird at heart. He’d never seen one go after a smaller animal. This is an excerpt taken from the novel I wrote entitled 'The Red Wing Sings', which uses the red-winged blackbird to symbolize the spirit of Canadians and Canada in terms of their historic relationship with the much larger and more powerful US. Ie. 1812 It's also a bird that inhabits Canada's marshlands from coast to coast to coast. This is a bird that makes me think of my childhood in Canada. It's one of the first birds I knew the name of. I was cycling along a quiet rural road one weekend, when out of nowhere, I felt a pecking on the top of my helmet. Looking up I was startled to see a small red-winged blackbird flying above me. He just kept screaming and screaming, and I quickly picked up the pace and pulled away. I figure if a small blackbird has the cojones to peck someone minding his own business as he cycles by, he is good enough to represent our country. The red winged blackbird is a favorite bird of mine. I have seen them in parks and even in my backyard. They sing a cheerful song which reminds me of the the people and spirit of Canada! My choice for a bird to represent Canada is the Red Wing Blackbird. It is predominantly found on wetlands, something Canada has in abundance. It's almost liquid song is one of my looked for heralds of spring. It boasts red bars, a connection to the maple leaf on the Canadian flag. Lovely bird with wonderful song. I feel like I'm home when I see a red-winged blackbird. I am not a bird watcher, but in grade school I did a project on the Red-Winged Black bird and since then have been fond of them. You see them everywhere, and its a joy when each time I do. Every where you go in Canada this beautiful bird is visible , along highways , trails & campgrounds . Great to photograph in the marshes. Perfect song from them with that sharp red colour on their wings,while they perch on cattails. What do I love about red-winged blackbirds. I really enjoy walking around marshy areas and these lovely birds enjoy hanging out in those areas as well. Their calls are very distinctive and to me very cheerful. Their presence centres me and reminds me to breathe and linger in their company. And when they fly around, their plumage is brilliant. The Red-winged blackbird is a common site, but that signature flash of red and yellow always excites. It is equally happy to make a living in an industrial drainage culvert or along a pristine lakesides. The red-winged blackbird is not fussy. It is jovial and social and just the right mix of plain and brilliant to be Canada's bird. Kok-le-reeeeeee! This s a bird that is pure poetry, without being an agressor or a parasite. These beautiful, clever, and fearless birds have engaging personalities. Our son who has autism is a birder. When he visits his red winged blackbird friends in Jerico Park, Vancouver, and makes their call, they fly to sit on his hand although he has never fed them. I Like this bird very much.. and common for many Canadians. The red-winged blackbird has a beautiful song and when I see it sitting on a row of fence posts I think of the vastness that is Ontario I think of my pioneer ancestors and them working the land and the growth of my Province. The sight and the song of this charming bird always makes me smile and remember where I come from, the greatest country in the world Canada.. The Red-Winged Blackbird has been a favorite of mine ever since I first heard its song - unmistakeable and easily identified - can listen for hours on end to this lovely bird ! Reminds me of marshes and rivers ! I like the Red Winged Blackbird because I love the sound it makes and I also love that it is a sign of spring. The Red-Winged Blackbird is a beautiful, strong and fast bird and it repersents canada well because of the red on its winges. The red-winged blackbird is often one of the first birds to come back after winter is over. For me, hearing the red-winged blackbird sing means the spring has arrived. Also, in the summer, it can be found across the country, from the maritimes to the west coast. My favourite of all birds. When I emigrated to Canada, it was love at first sight. Love when the red-winged black bird,calls to his mate and flies through my backyard which is next to swampy land.Very calming effect. The sound of this beautiful bird, is always a sign of spring and better weather. I am longing to hear their song soon. They are a welcomed delight to our garden. Growing up, red-winged black birds were ubiquitous. One of the many birds frequenting my grandmother's feeders. It seems that wherever I have traveled in Canada, there is always a Red Winged Blackbird somewhere nearby, easily noted by its distinguishing trill-like call and flash of bright red shoulder patches. This hardy bird is seen anywhere near water and reeds, including roadside ditches, canals and quiet waterways. I have memories of seeing these birds since a young child and am always fascinated by their activity and habits. I believe this is the bird to represent Canada, forget the ubiquitous Canada Goose and the ever-present Morning Dove which everyone still calls Pidgeons (Falcon food). I realize the vote count is low but hopefully more people will come around and support this choice. The red-winged blackbird is, for me, always the first 'bird' sign of spring, returning to Toronto's ravines just as the season was turning ... at last! The sight of the bird was such a gift. I always loved its strange hoarse caw and the flashes of red on its wings. When I was a little girl (decades ago!) books of stickers were popular, sheafs of six different-but-all-from-the-same-family things. Of the "Bird" stickers, my favourite was, again, the red-winged blackbird. Gotta go for the RED! We saw them every time we walk around a pond or lake. They are so beautiful and the songs are very special. I just find that it is an easy bird to spot and find, I like it's song. J'aime le oiseau parce que j'aime les épaulettes rouges et parce que c'est très beau. One of the first birds I could recognize and name after the sparrow, the red wing black bird adds colour especially around marshes and bull rushes. C' est l'oiseau qui me rappel le plus mon enfance. Avec lui le printemps arrivait. . Ilmest tellememt drole a voir se balancer perché du haut d'une pragmite ou autre grandes brindille. Son chant est très special et enjoué. Every year I knew the winter was over when the red-winged blackbirds showed up. Their happy song was a spring song in my ears! There is something hauntingly exhilarating about the call of the redwing blackbird announcing the arrival of Spring in this fair land! He reminds us that our grassy wetlands are still very much a part of our environment, and I think the music of his call would be sadly missed, should he run out of his habitat and a chance for him to celebrate his life as a Canadian! Red-winged Blackbirds are seen all across Canada during the summer. Where I live they are here all winter, and they sing all winter. A large number of males come in fall. I have seen more than 70 in the poplar trees near my home where they flock and sing. Their choir practice causes people to stop in amazement, sometimes trying to photograph them. There are lots of people who walk here as it is scenic with little traffic. One woman exclaimed, "listen to those birds, it's like the tropics here." The birds come to my feeders for shelled peanuts and black sunflower seed and suet cake. I put fresh seed out every day. In spring the females begin to come, then the birds pair up and leave for their nesting sites. There are lakes and ponds near my home, but most of the birds must go much farther away to nest. I am so happy that they spend the winter here and give so much pleasure with their flashy appearance and joyful song. I think they would be a good National Bird. They are beautiful, their song is beautiful, their summer range is almost entirely within Canada (covering almost all of Canada), they are just darn fine birds. I have always loved the highly-recognized and melodic call of this bird as well as it's colorful wing bars. On a cross-Canada road trip last Spring, this bird greeted us with it's song and appearance from coast to coast. Easily identifiable, both it's appearance and it's song, my vote is for the Red-winged Blackbird as Canada's symbolic bird. We had a blackbird that would come to our deck for many years and sing his song!! We are sure it was the same bird returning every year. It inhabits every Province & Territory across this great nation. I would like to see the Red Winged Blackbird be voted Canada's national bird as it has the red on it (which ties in with our national colours) and they have such a lovely voice. It would be uniquely Canadian and a show stopper. 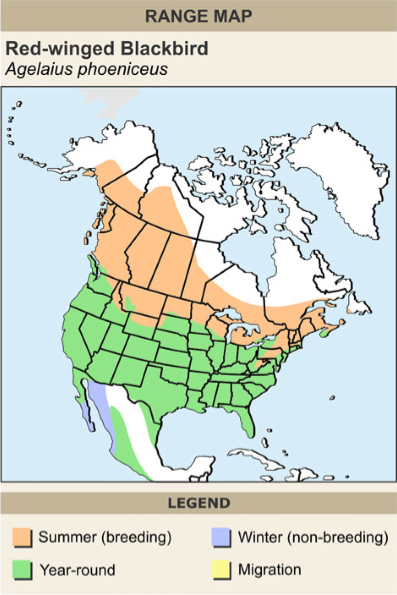 I think that in order to be voted Canada's National Bird, the bird selected should be a bird that can be found almost anywhere in the country and not just in specific regions. The trilling sound of the Red-Winged Blackbird can be heard almost everywhere you go in this country. I have always loved the Red-winged Blackbird. It often hangs out around wetlands of which Canada has many. When I hear it's song, it brings to mind my youth and gives me a feeling of peace and joy. It has a distinctive song and would represent Canada well as a nation of peace and joy. For me, the Red-winged blackbird represents the return of spring... I look forward to its return every year, and associate its unique profile with the smell of a spring wind and the sound of rushing spring meltwater. I am a Canadian citizen and Environmental Educator. I spend my days with visiting school groups at the Wildlife Refuge where I work and have learned the wonder and importance of accessible birds. I am fascinated and astounded by Snowy Owls as much as the next person, but most people will go their lives without ever seeing one. On the other hand, a good majority of people have seen crows, pigeons, Canada geese, etc. THOSE are the birds that the average person interacts with. Wildlife lives with us in our cities and towns, in our parking lots and on our roofs. We sometimes mistakenly equate rare with wild. This is a dangerous confusion, for we then ignore the life that is with us everyday, and we can forget to learn from and enjoy the species that make their homes a little closer to ours. It is for this reason that I chose a common bird. As a national symbol, the red-winged blackbird is visually striking, but it also gives people the opportunity to have experiences with them. Real-world interactions are that which really captures our hearts and our imaginations. I would rather have a drab bird in front of me, than a striking and rare bird in a photograph. And I know at least 3,000 students and adults who would agree with me. I always am thrilled to see the red winged blackbird. Whether I have been walking or biking or driving in the country I have sighted this wonderful bird. It has beautiful plummage, a lovely song and lives happily amongst the human population. I don't want the loon or the Canada Goose. I remember as a child that the red-winged blackbird was the first bird I could easily recognize. The black and red make me think of strength, the RCMP, and Ottawa - whose sports teams (Senators, 67s, RedBlacks) feature red and black as team colours. It is ubiquitous but doesn't foul the surroundings like the Canada Goose. Only when I hear the song of the red winged blackbird, do I welcome the spring to Ottawa. I travel internationally a lot for work, but nothing makes me feel more at home than the morning call of the Red-Winged Blackbird, down by the shores of Lake Ontario. Growing up in the country in Niagara peninsula I loved the sound heralding spring of this bird! I continued to enjoy their songs as they perched on wavering cat tails around Perth, Ontario and along the shores of St. Lawrence and Ottawa rivers. A delight to see and hear! I would be proud to have the red-winged blackbird as our national bird. Beautiful bird. Doesn't do tricks. Selected because of its beauty, proud and distinctive call, it's love of wetlands, and the way it protects its nest at all costs. As a bonus the red shoulders match the maple leaf on our flag. I have traveled extensively through Canada and wherever I went, I could see the red winged blackbird. It has an iconic song which is very recognizable. Although I am living in Thailand at the moment I hold a Canadian passport and keep in touch with current affairs. 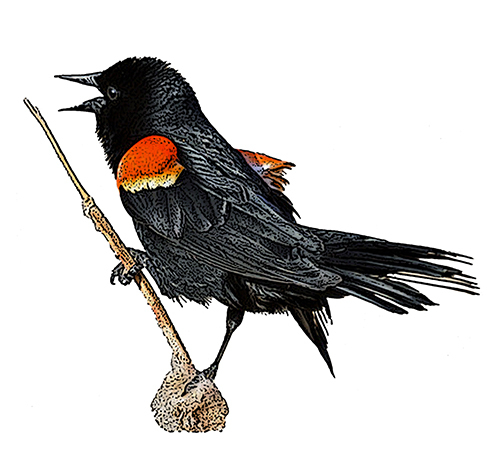 For me, when i think of the qunitessential,beautiful Canadian bird, I think of the Red-winged blackbird. Whether it is ofchildhood memories of growing up in Montreal and spending summers along the St. Lawrence Seaway or trips by car across Canada, I always think of the Red-winged blackbird and its beautiful and eye-catching colour. I live in the city where much of our songbird population has been decimated by wily and voracious magpies. However, in a nearby park, I frequently see and here red-winged blackbirds. One which I assume is male, keeps an eye on activity around the pond located in the middle of the park, and sounds an alarm when a dog or human approaches too quickly. Other song and water birds respond to his signal by becoming very still in the rushes or swimming quickly toward the small island in the pond's centre. I am delighted by the song and the red band on the wings. The blackbird is also the subjec of a song by Sir Paul McCartney, so that seals my vote. Seen in almost all of Canada, easily identifiable, and Beautiful. The redwing black bird is abundant in Brant County, where I live. I get such a thrill when I spot them flying around my home in the springtime. To me they represent a transition from urban to rural living, and the connection with nature and the environment that this has offered me. We've driven Canada from coast to coast and the one bird you can always count on seeing along the way is the Red- winged blackbird, perched in the tall marsh grasses or reeds, or if you are lucky, in flight with its brilliant red & white bordered wing patches displayed. Unlike some of the others on this list, it's a bird that is instantly recognizable by any Canadian. I really associate red-winged blackbirds with Canada, because the times I've driven between cities, like Toronto and Montreal, I often spotted one. I also love that they have a hidden splash of red that spreads out when they extend their wings and fly! Beautiful birds. Deserve the honour. The song of the red-wing blackbird, nothing compares to it for announcing spring! The bright red flash of colour draws my attention for a quick look as I drive along the grey four lane highway. The red-winged blackbird is all along the side of the highway and they just add a little life as you spot them in the bullrushes.